The skin of Inari-zushi wraps vinegared rice and has so sweet soy-sauce flavoring that you don't need another side dishes. has so sweet soy-sauce flavoring that you don't need another side dishes. The beautiful glaze seems also delicious. dashi soy sauce, water, sugar, mirin, and sushi-vinegar. Blanch the fried tofu and drain the water. Cut it into halves and widen the inside. with 1 and 1/2 of sugar. In the soup, boil the fried tofu. Just before taking the pot off a fire, add mirin to glaze. fold the sushi-vinegar into the rice. you can flavor the rice. Stuff the fried tofu with vinegared rice. Shape them and dish them up. 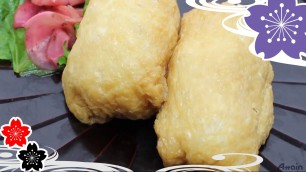 ✍Please care for not breaking fried tofu when stuffing. Sesame makes them aromatic and more delicious. In Japan, people often put Inari-zushi in Obento. Vinegared sushi is easy to digest. When you put some ingredients in the rice, it won't go bad. So, Inari-zushi is a very popular dish.